Today, the Associated Press captured a photo of French President Francois Hollande shaking hands with Leenby, a Cybedroid robot. Hollande, like so many politicians around the world, has been captured on film shaking hands with many robots over the years. And I used to think this was simply a way to appease our future robot overlords. But I have a new theory: Robots don’t like the West’s new nationalists. Now, hear me out on this. In the past, I’ve been critical of all the politicians so willing to pal around with robots. But when I think of who all these robots are shaking hands with, I can’t help but wonder why the new crop of nationalists are never there. Same goes for members of Greece’s neo-Nazi Golden Dawn party. Not a single one of them have shaken hands with a robot, to my knowledge. Make no mistake, robots will shake hands with conservatives. Canada’s Stephen Harper shook hands with a robot in 2015, British Prime Minister Margaret Thatcher shook hands with a robot in 1982, and California Governor Arnold Schwarzenegger shook hands with a robot in 2009. Even George W. Bush was more than happy to shake hands with a robot in 2005. But the ultra-nationalist right wing politicians around the world have not been friendly with robots. Center right politicians like Australia’s Prime Minister Malcolm Turnbull? Handshakes and selfies all around. Lefty politicians like Canadian Prime Minister Justin Trudeau? Gotta get that handshake. Barack Obama and Angela Merkel have both shaken their fair share of robot hands. But men like Trump have yet to be seen with one. It only occurs to me now that this might be the choice of the robots. Are these robots from the future and if so, are they trying to tell us something? Should we be worried that they won’t shake hands with the likes of Trump and May and Le Pen? Only time will tell. 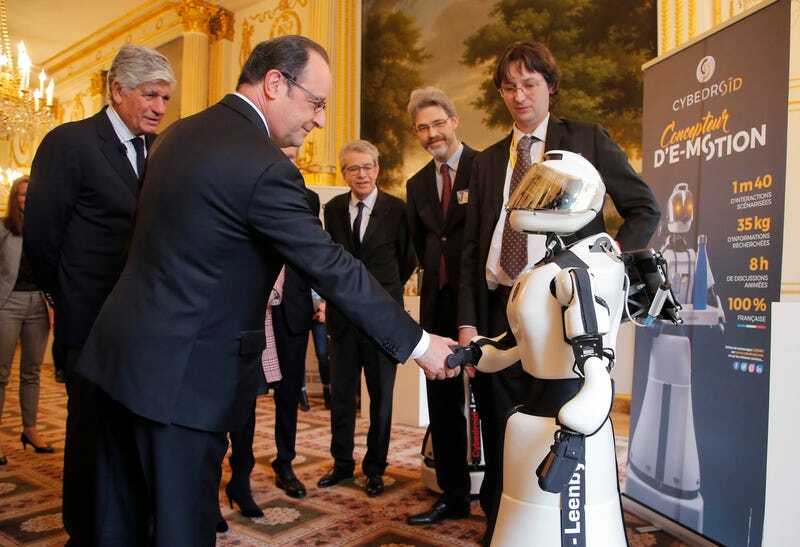 On second thought, Hollande’s love for robots is almost creepy. In this picture from 2016, the robot almost seems scandalized—like they were caught in the act of something more nefarious. I don’t know what to believe anymore! All I know is that the robots are going to win one day. And the first person to capture Trump shaking hands with a robot wins 10,000 Gizmodo points, redeemable wherever Gizmodos are sold. Why Is Angela Merkel Always Palling Around With Robots?